Doing the Accord Air Filter replacement procedure on a 2006 Honda Accord EX is a five minute job. 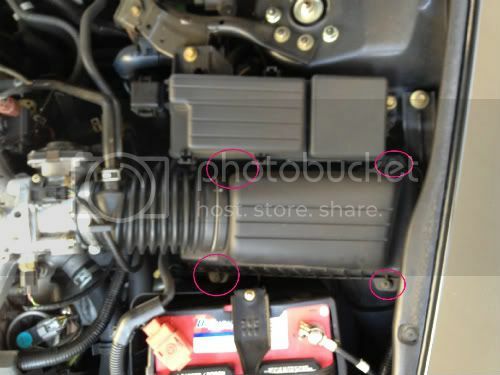 Simply unscrew the four screws as shown in the photo below and gently pull up the air filter housing. You don’t need to disconnect the air snorkel, pulling it up gives you enough clearance to swap out the engine air filter. I recommend the K&N air filter replacement. Unscrew the air filter housing in the four places shown and then lift the cover up enough to access to the engine air filter element. 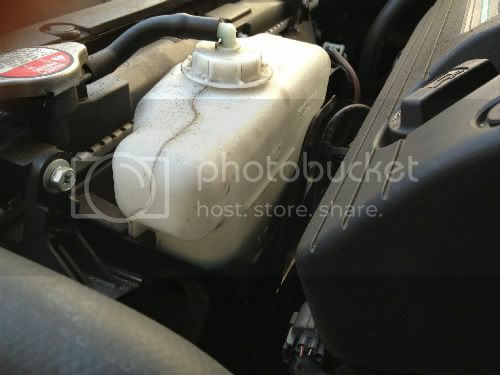 To check your coolant level, while the car is cold and off examine the coolant reservoir as shown in the photo below. There’s a minimum and maximum indicator line, make sure the coolant is in that range. Pretty simple. Use a 50/50 mix of Anti-freeze and distilled water for the proper cooling mixture. It’s OK if the ratio is off slightly like 40/60 or 60/40.